By endorsing Colorado Senate candidate Cory Gardner, The Denver Post threw its weight behind a man whose views and actions are in stark contrast with the paper’s previous editorial stances. 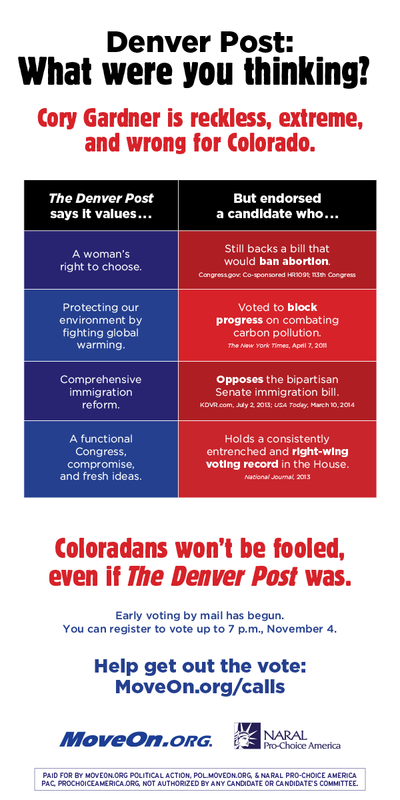 MoveOn.org Political Action teamed up with NARAL Pro-Choice America to run a full-page ad in Sunday’s Denver Post because Colorado voters deserve to know Cory Gardner’s true record, from voting to shut down the government to supporting a bill that would ban abortions to trying to block a law that would cut carbon pollution. 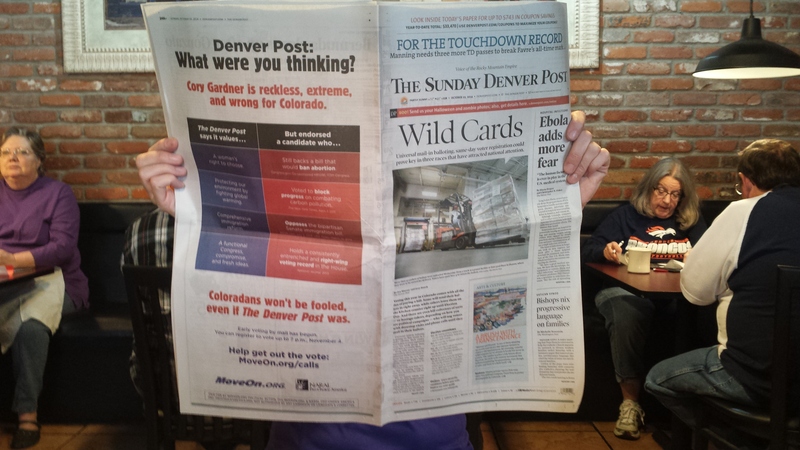 Please share this ad on Facebook and tweet it @DenverPost using the hashtag #WhatWereYouThinking. In addition to sharing the graphic, will you sign and share MoveOn member Jamie Chesser’s petition calling on The Denver Post to retract its endorsement of Cory Gardner? More than 7,000 Coloradans have already signed. Click here to sign and please forward Jamie’s petition to individuals in your network–especially if they live in Colorado. The Denver Post ad was paid for by MoveOn.org Political Action, pol.moveon.org and NARAL Pro-Choice America PAC, www.prochoiceamerica.org, not authorized by any candidate or candidate’s committee.